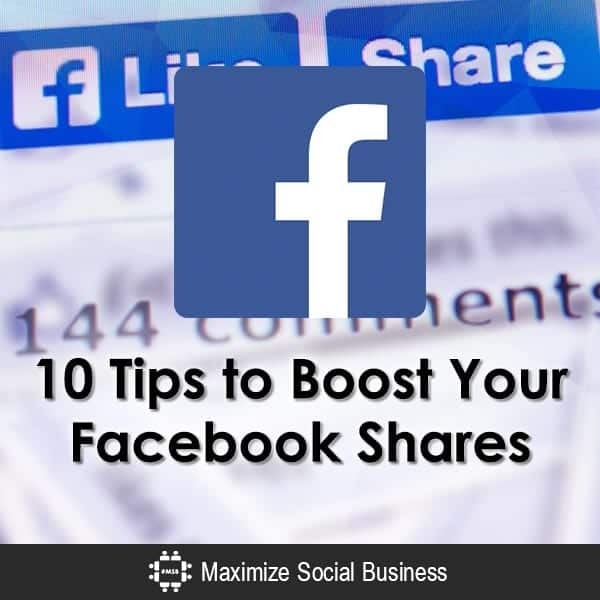 Want to boost your Facebook shares? Try these 10 practical tips. Getting people to share your Facebook posts can be difficult, especially if you don’t have a large following. Even with minimal followers, some posts get shared more than others, mostly because the reader can relate to the story. Here are 10 reasons why your Facebook posts aren’t being shared. They should help you stay away from unpopular content and build your following. If people find what you post uninteresting, they won’t share it. Facebook’s algorithm determines what everyone sees from their “liked” pages. Posts with high engagement are shown to more people organically in their news feed. So with more views, you’ll get more shares. To share a post, the reader needs to like, be inspired by, or agree with the content. You can see this with political Facebook posts. You may see a lot of comments, but relatively few likes and shares. While comments play a role in how many people see the post, it’s a much smaller role than a “like” or “share”. “Shareable” content is content that others see themselves posting and so they quickly move to the share button. Sometimes, the lack of post engagement comes down to the time of day you post. It’s common sense that posting at 2 a.m. local time won’t get you a lot of attention. Posts get the most engagement around 8-9 am and 5-8 pm. Posting during the middle of the day when people are busy with work or school means your content is down in their news feed. Your Facebook Page Insights will tell you the times of day your fans are most often on Facebook. Use this! Frequent posting is a good thing when you’re keeping your page active with one or more posts a day. Regular posting shows Facebook that you’re maintaining your presence, and it’ll help your posts reach more people. If you’re posting 7+ times a day and expect to get lots of engagement on all your posts, it probably won’t happen. Facebook’s News Feed algorithm will filter out most of your posts, and people who see your updates may ignore them. Something exciting or important to you may not be appealing to your customers. For example, people who like Apple’s official Facebook page may share a news story detailing when the iPhone 7 will come out, but they may gloss over a story about the iPhone 7 gaining .4 megapixels on the front camera. A small number of camera enthusiasts might share that story, but most consumers just don’t care enough about something so niche that they would share it. This happens when you promote your page using bad demographic data (or no data at all) to determine your target market. The people who like your page and see your posts may not be as interested or engaged as someone in your target demographic. Zeroing in on the people most likely to interact with your posts is the key to getting more shares. Even the most interesting posts need a bit of attention before they go viral. If you have a small number of followers, focus more on growing the number of “likes” (fans) on your page as opposed to creating posts and hoping they reach a broad audience. When people see the same thing over and over again, they tend to tune it out. Even if the posts aren’t exactly the same, if they’re similar enough that people think “Oh, that again?”, you’ll need to switch it up to get people interacting with your posts. Are you using different post types Large, vivid images and video, and not just text? Just like posting at the wrong hour of the day can limit the number of shares, posting on the wrong days can do the same thing. It might seem like people spend the same amount of time each day on Facebook but that can vary! It’s critical to review your Page Insights because your audience may dip on Monday’s, be active on Wednesday, Friday, and Saturday. If you miss the most active days, you can be missing out! Study the data Facebook gives you for your Page to find out. If you’re re-posting something that you’ve posted before or has appeared somewhere else, there’s an excellent chance your post won’t get many shares. Nobody wants to be the person who shares what everyone else is sharing. As you can see, posting is an art with science! It takes a review of data, creativity, and a plan in order to generate increased Facebook shares. What’s a step you need to take now to improve your posting?